Fight crime and save the city in Western Chief™ Kids Batman Crime Fighter Rain Boot. Waterproof rubber upper with awesome Batman© print. Two handles for easy on and off. Breathable cotton lining helps keep little feet dry. Deeply treaded rubber outsole for traction. Imported. Measurements: Weight: 12 oz Circumference: 10 in Shaft: 6 3⁄4 in Product measurements were taken using size 9 Toddler, width M. Please note that measurements may vary by size. Weight of footwear is based on a single item, not a pair. 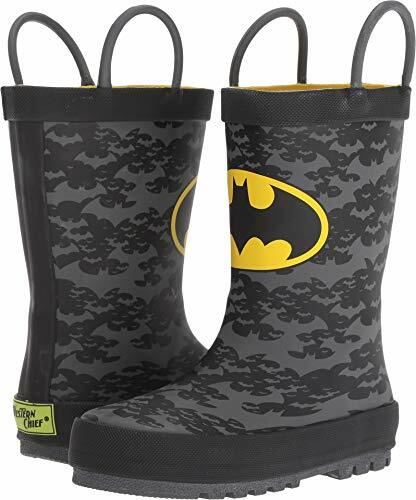 Fight crime and save the city in Western Chief™ Kids Batman Crime Fighter Rain Boot. Waterproof rubber upper with awesome Batman© print. Two handles for easy on and off. Breathable cotton lining helps keep little feet dry. Deeply treaded rubber outsole for traction. Imported. Measurements: Weight: 12 oz Circumference: 10 in Shaft: 6 3⁄4 in Product measurements were taken using size 9 Toddler, width M. Please note that measurements may vary by size. Weight of footwear is based on a single item, not a pair.